At Laser + Holistic Dental we understand the overall health benefits of restorative sleep, which is why we offer a number of snoring treatment services to improve the symptoms of your Sleep Disordered Breathing problems. Improving your snoring symptoms can have a massive positive impact on your productivity, feelings of well being and the happiness of your partner. Please use the list below to navigate through the topics and treatment options. Snoring is more than just an annoying noise – it actually is the soft palate vibrating indicating that the airway is not open properly. Because snoring is a partial blockage of the airway less oxygen reaches your lungs, leading to increased pressure on your heart and circulatory system as your body attempts to cope with reduced blood oxygen levels. Snoring is the main symptom indicating that you may have Obstructive Sleep Apnoea (OSA), a sleep breathing disorder where you regularly are not breathing for more than ten seconds at a time due to blockage of the airway. People with Obstructive Sleep Apnoea are at a much greater risk of serious negative health events such as heart attacks, strokes – potentially causing death.1 For children with symptoms of Sleep Disordered Breathing such as snoring, clenching and grinding teeth, bed wetting and mouth breathing – there can be significant impacts on their growth and cognitive development. Obstructive Sleep Apnoea (OSA) occurs when the airway is blocked by soft tissue such as the tongue. If you know that you snore, your risks of serious sleep breathing disorders are already elevated. You can conduct two easy forms of self diagnosis to understand your health situtation even further using the Friedman Tongue Position and the Epworth Sleepiness Scale. The Friedman Tongue Position measures the position of the tongue relative to the other soft tissues in the back of the throat. This method indicates the size of the tongue – which correlates to increased severity of Obstructive Sleep Apnoea.2 , 3 You can self assess using a mirror – open your jaw without straining it to see the back of the mouth and throat. Position I allows visualisation of the entire uvula and tonsils/pillars. Position II allows visualisation of the uvula but not the tonsils. Position III allows visualisation of the soft palate but not the uvula. Position IV allows visualisation of the hard palate only. The Epworth Sleepiness Scale was developed as a simple test to measure daytime sleepiness – a symptom of Obstructive Sleep Apnoea. A score of ten or higher indicates that you may be suffering from a sleep disorder leading to abnormal levels of daytime tiredness. If you have scored ten or higher it is recommended that you seek further medical advice to identify if you are suffering from Obstructive Sleep Apnoea. You can do the test online here. To date, typical treatment methods for snoring and other sleep disorders have been compromising such as cumbersome CPAP Machines or the need for invasive surgical intervention such as Uvulopalatopharyngoplasty (UPPP) which cuts out soft tissue from the back of the throat. The invasive nature of such treatment options are so overwhelming that many people decide to battle through their symptoms instead of pursuing these sorts of treatment. Recent technological advances have led to the development of our preferred treatment methods – NightLase and Oral Appliances. We strongly encourage patients to undergo periodic sleep studies in order to measure the efficacy of each treatment method – helping us to guide your continued care. To learn more about Laser + Holistic Dental’s position on the importance of restorative sleep visit this page. NightLase is a revolutionary walk-in, walk-out snoring treatment that users laser energy to tighten soft tissue in the throat – improving airway volume and reducing snoring and sleep apnoea. NightLase uses the Er:YAG laser wavelength to stimulate the tissues using a photothermal effect – this triggers protein transformation in the collagen fibres which causes the tissues to tighten, creating more space in the throat for breathing. Because the laser is operating with only moderate energy at temperatures around 40-48°C, there is no ablation of cells. The sensation of the laser is similar to having a fine mist of hot water sprayed into the throat. Patients are generally surprised at how painless the NightLase procedure is. No anaesthetic is needed, and patients can talk, eat and drink normally once the procedure is over. 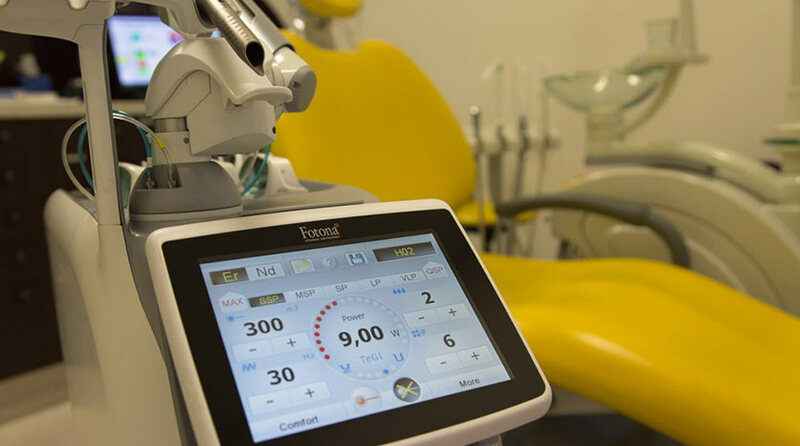 Dentists trained in NightLase use the laser to target the anterior pillar area, soft palate, uvula, hard palate, posterior pillars and tonsils and the lateral and bottom area of the tongue. For the treatment to be as effective as possible, NightLase is offered in a course of several treatments over about seven weeks with a maintenance appointment recommended annually. For more information about the NightLase snoring treatment please call (03) 9078 0387 or get in touch with us today. At Laser + Holistic Dental we offer oral appliances to treat snoring and sleep disordered breathing by working in conjunction with Respiratory and Sleep Medical specialists. Our preferred oral appliance device is the EMA (Elastic Mandibular Advancement). The EMA is designed to treat snoring and Obstructive Sleep Apnoea by gently moving the mandible (lower jaw) forward which helps the tongue from blocking the airway during sleep. The interchangeable elastic straps increase airway space, coming in nine different lengths and four different strengths. This means that patients can use their EMA with maximum comfort, starting off with more flexible elastics and then increasing the mandibular advancement through increased resistance over time. Aside from the benefits of convenience and discretion relative to CPAP, the EMA appliance also has additional advantages of being able to serve the purpose of an orthodontic retainer and bleaching trays for home teeth whitening kits. For more information about using oral appliances as a snoring treatment and the EMA appliance – please call (03) 9078 0387 or get in touch with us today.